What is there to say? Eating this beast of a sandwich is the most gratifying aspect that Santa Cruz, CA has to offer. I mean, I guess there are the cliffed beaches, the dense forest, the deep caves, the great surf, the Banana Slugs, the drugs, the human slugs, and actual slugs… But all that nonsense hails in comparison to Zoccolli’s Deli, one of Santa Cruz’s oldest businesses dating back to the 1940′s. Located downtown, I parked my car and hustled my way through the door. I took ticket number 24, and ordered the “Italian Club”. The Italian Club is served with a pesto-mayonnaise blend, roasted turkey, ham, onions, roasted peppers, swiss cheese, lettuce and tomatoes, all on a ciabatta roll. I asked for capicola to be substituted for the ham– I’m not the biggest regular-ham fan. 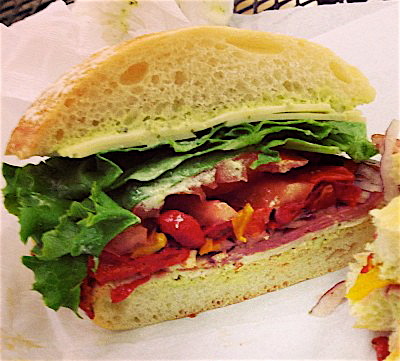 Everything was great about this sandwich, and I do mean everything. Between the two types of meats, the roasted peppers, and the swish cheese I couldn’t decide which ingredient I enjoyed the most. And then to be greeted by fresh tomatoes, cold-crisp lettuce, and snapping onions; I knew I had found my home. However, prior to taking that first bite, I was still unsure of my feelings towards the pesto aioli. Mainly, I was worried that the pesto-flavor would be too strong and overpower the others. But da-yum (a two-syllable), were my fears dispersed as the aioli settled into the mix. Priced at $6.75, you really can’t beat it. Holy Catwoman, just thinking about it now makes my stomach grumble and mouth water. 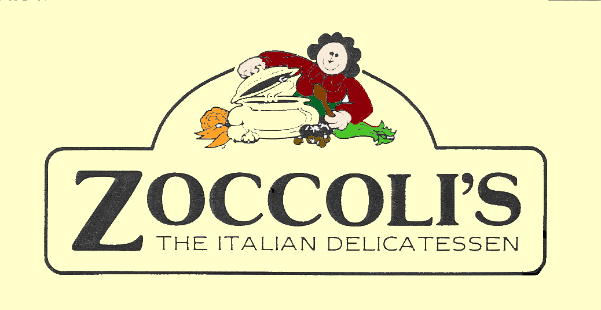 Thus, I give Zoccolli’s my Gotta Go! rating.